I set out to see if weathering powders are worth it. The answer is a definite YES if you're looking to add that extra bit of realism to your models. They're fairly easy to work with and you get results that you can't get with any other medium. A few weeks ago, I posted the question "Are weathering powders worth it?" At that point, I managed to get a hold of two tanks and a few weathering powders to try. I'd planned on just posting a before and after pic and some notes after my experiment, but as I went along, I collected so much that it would make an unwieldy single post. So I'm breaking this into two parts. First, what I've learned, and second, the results. I had no experience with powders before trying this. I figured I would pick up a handful of powders that seemed like they would work and just sort of see what happened. Since I have no tanks (that I'm willing to sacrifice) I contacted a couple friends of mine who play Imperial Guard to see if they would "loan" me a tank or two. I contacted misterjustin from Secret Weapon Miniatures and had a good long talk with him. I ended picking up a few colors I thought would be useful. Instead of picking up one of each color, I ended up sticking to "browns" and picked a number of shades for variety. In the end, I had: Exhaust Black, Metallic Iron, Rust Orange, Rust Red, Rust Brown, Clay Brown, Terracotta Earth and Dark Earth. Two of my friends each loaned me a tank for my experiment. I actually lucked out with the tanks, both were basecoated and one was light colored and the other dark colored. Then it was time to experiment. 1. This is absolutely tons of fun to do. I can't remember when I've had this much fun "weathering" a model. It's quick and easy to apply the powders. You see it come to life in your hands. Nothing like instant gratification to keep you motivated. Like all things in the hobby, pigments can get expensive. To do it well, you really do need about 3 shades of each color you want to use (for variety). I know it seems like overkill, but the variety is what really helps bring your model alive. 3. Powders or pigments create an environment. With just a little bit of powder, your tank comes to life and it looks like it's been in an actual environment fighting. It's an effect you can't create (that I know of) with anything else. You'll end up with a bit of mess when you're done. You need to have an area to work in with certain brushes set aside for just powders. I ended up working over a piece of paper to catch the powder that falls off the model. I also grabbed a handful of older brushes and cut the tips off to create "stipple" brushes I could apply the powders with. 5. It's not an exact science. There are no hard and fast rules for applying powders when it comes to colors and such. But, you do need to have a plan before you start. 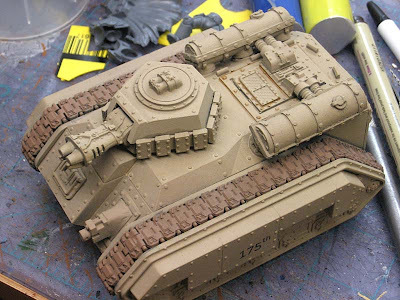 You need to know what the dust would be like where your army is fighting, where the exhaust comes out your tank, what areas would be prone to rusting, etc. before starting. 6. Powders will not replace all other kinds of weathering. These are just one more trick in getting a model to come alive. 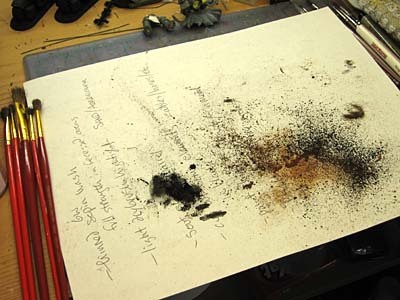 Powders don't replace paint or washes and the things they can do when it comes to weathering a model. It's the combination of these different techniques that really does the trick. Can you get a good looking model without powders, sure, but take that same model and use powders on it and you'll be absolutely amazed at the difference. Eagerly awaiting part 2. I need a quick way to weather my hordes of Templar rhino and speeder hulls. I have only just started using them myself and I must say I agree with what you have said in the article. They are great! The one thing is to a powder newb it is quite wierd because there are literally loads of ways to apply. Have a plan - and surf the net for tuts. Look for scale model sites more than gaming ones. As I am about to start my first weathering attempts on my Khorne transports and Land Raiders I am watching this with a keen interest. You may have just sold me on buying the weathering pigments from secretweaponminiatures. one question. So once the pigments are applied - do you then apply a sealant coat (say GW sealer) over the model to "seal" the pigment in? Brother Loring: I'm getting all my pics together now. Mart; Very true, excellent point. Col. Hessler: We'll see, you guys can tell me how I did on Sunday hopefully. Keep in mind though, this is my first attempt at these so the results aren't the "greatest" so to say. There's a definite improvement in how the final model looks, but I'm still learning and have a way to go with these. The IC: Yes, you can seal them after applying the pigments, but I'm told it's only a light dusting to keep the pigment there... it's not like you're regularly sealing a model. I may have gone a bit heavy with my sealer (using it as I normally would) and this muted my results somewhat. The flip side of that is that the model doesn't look overdone which it may have if I hadn't sealed them. What are you using to get the pigment to stick to the tank? I have been experimenting with thinned olive oil (got this tip on line) and water and have had poor results. I'd love to know what you use to get the powder onto the tank and have it stay where you want it so it can be clear coated sealed onto the tank. HuronBH: Ummm... nothing. I just took some old brushes I had and cut them down into "stipple" brushes and simply applied the powder to the tank. After I worked it into the area with the brush, I would tap or blow the loose stuff away and then added more if I thought I needed it. I just kept repeating the process. @huron. you can use isopropyl alcohol. Wets it down then dissipates. 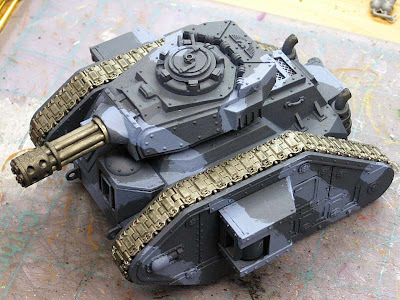 You can also mix them to make a weathering wash.
My issue has been and if anyone can help I would be most grateful for is I tried a light dusting on a rhino and it looked great, came to sealing and it killed it! It seems to me if the pigment comes into contact with fluid it kills it! Death OF Angels is right on. Most people use isopropyl. You get a huge bottle for around $1. Look for it the "first aid" section of the drug store. Also, like Mart mentioned, Mig makes a pigment fixer that does the same job although I don't know first hand how the results compare. @Mart: One other product I use is the weathering packs from Tamiya. They look like a 3 color eyeshadow case with an applicator and everything. This product has a tendency to stick more than a standard powder and it hasn't reacted poorly to Dulcoat, at least not for me. The only time I ever used weathering pigments, a friend had suggested to just buy chalk in the tones you want and sand it for the powder. Looking at what is available from secretminiatures, I might have to give them a try. Looking forward to part two. I have had very good results with the Bragdon brand of powders.. plus they are a good way to get your feet wet without breaking the bank. 12 colors, 2 ounces each (that's actually quite a bit) for 25 bucks. Most places that deal in the model train hobby sell them. Or find em online. @Mart: Force and friction are also two factors in how well the pigments stick. I've found that light dustings unfortunately do exactly what you said they do... look great until you seal them. You have to over-use them by just a bit due to the dullcote (what I use at least) spraying actually blowing off some of it. I have used the Tamiya and dulcote combo and have had some cool realistic effects also with it and I would also recommend that root. The seal doesent seem to effect them as much. Thanks, I am pretty new to them so its trial and error thanks for the pointers. It looks like folks have already answered the bulk of the questions - but since sealing is the one I hear most often, and I see it a bunch here, I'll make a video for Ron to post. Jog the matte sealer across the pigments. Start by spraying away from the model then move QUICKLY across the pigments. Wait 15 minutes and do this again. You are fixing the pigments in place and NOT sealing the model at this stage. I'll chime in with another vote for isopropyl alcohol as a fixer. It's what I used in the video above and what I use about 90% of the time. I can reach a liter of it from where I'm sitting. A point of clarification for folks that talk to you about pigments vs. inexpensive pastel sticks. PASTELS ARE NOT AS GOOD AS PURE PIGMENTS! Pastels are held together with carnuba wax and inexpensive pastels are made with lower quality pigments. For best results use real pigments. The only two brands I recommend are Secret Weapon (of course) and MIG. I have several other brands but won't recommend them -- or call them out as I see no need for it. I will only speak out against pastels. Also a big thanks to Ron for giving such a great look at the Secret Weapon pigments - and to everyone thinking about trying them. Use coupon code "ONE10" for a one time 10% discount on your order - which should help make pigments more affordable. Lastly, a $4.50 bottle of pigment will probably last most of you years. With as often as I use pigments, and the workshops I teach, I'm still using my first bottles of each colour after nearly a year. Happy to answer any questions and will work with Ron to add a bit more to the weathering series. 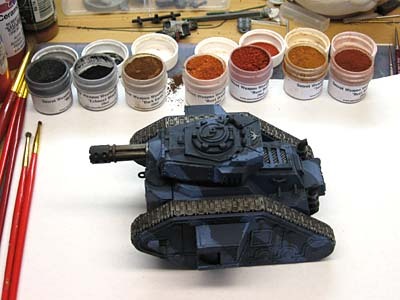 I've been using Justin's weathering pigments on my Imperial Guard tanks and love it! 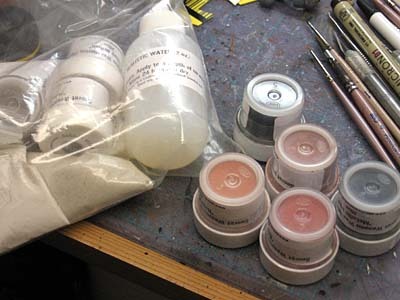 I picked up some other companies weathering pigments from my local train supply store- and its not nearly as good as the stuff from Secret Weapon Miniatures. I don't know what they do, but its great stuff. Using weathering pigments has become one of my favorite parts of painting my IG! Ron- consider the metallic iron- its my favorite by far. In fact I am starting to use it on all 'silver' sections of my models because the effect it gives. The ground graphite is awesome! Can I just say thanks to Misterjustin... some great tips there I am definately going to give a go. @DrGabe: Thanks for the compliment. A lot of companies with pigments use lower quality pigments and/or add adhesives to them. One of the sets I have (I bought their 12 pigment line) includes adhesive for instance. But you want pure, unadulterated pigment. I'm even considering replacing my two oxide colours so I can get a more pure pigment for them. @Mart: My pleasure! This really is my favorite part of the hobby. DrGabe: I do like the metallic one, it's one of those that has its own use and does it very well. I want to try my hand at using a graphite pencil for damage along edges and then maybe oils once I get through this.